Synthesizing the best current thinking about learning, course design, and promoting student achievement, this is a guide to developing college instruction that has clear purpose, is well integrated into the curriculum, and improves student learning in predictable and measurable ways. The process involves developing a transparent course blueprint, focused on a limited number of key concepts and ideas, related tasks, and corresponding performance criteria; as well as on frequent practice opportunities, and early identification of potential learning barriers. Idea-based Learning takes as its point of departure the big conceptual ideas of a discipline that give structure and unity to a course and even to the curriculum, as opposed to a focus on content that can lead to teaching sequences of loosely-related topics; and aligns with notions of student-centered and outcomes-based learning environments. Adopting a backwards design model, it begins with three parallel processes: first, identifying the material that is crucial for conceptual understanding; second, articulating a clear rationale for how to choose learning outcomes based on student needs and intellectual readiness; and finally, aligning the learning outcomes with the instructional requirements of the authentic performance tasks. The resulting syllabi ensure cohesion between sections of the same course as well as between courses within a whole curriculum, assuring the progressive development of students’ skills and knowledge. Edmund Hansen expertly guides the reader through the steps of the process, providing examples along the way, and concluding with a sample course design document and syllabus that illustrate the principles he propounds. "For Scholars of religious studies and philosophy, Idea-Based Learning has much to commend it. It is not directed towards any specific discipline; instead, Hansen has included examples from across the curriculum. Hansen's book is readable and thought-provoking. It does not bog down the reader with excessive theory or debate, but rather seeks to be a concise guidebook for course design. It is an excellent starting point for new teachers, while also offering something to those more seasoned in the classroom. Finally, his work provides enough context that the reader is encouraged to move beyond this particular work in order to gain further depth into one's own reflection on teaching." "Marr and Forsyth have written a very accessible and readable volume, one that is brief and yet comprehensive enough to adequately introduce the reader to the subject. Further, the explanations of the current milieu of higher education in the U.K. as well as the role of academics within this are lucid and helpful. those who are considering entering the world of higher education in England, Scotland, Wales, or Northern Ireland will certainly find this book valuable, particularly those interested in a career in teaching. Indeed, those considering postgraduate study in the U.K. may also wish to consult this volume, as it helpfully describes the lay of the academic landscape." "A guide to course design that emphasizes a starting point of big conceptual ideas within a discipline." 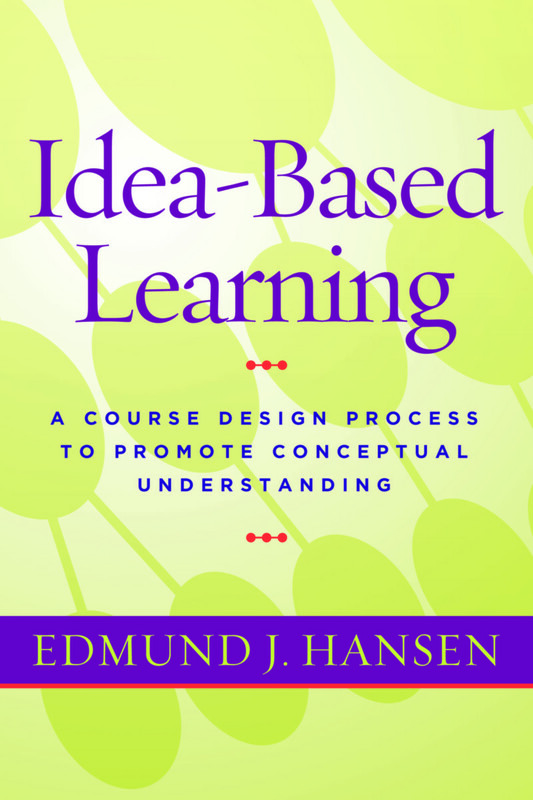 “In Idea-Based Learning Edmund Hansen shows faculty how college courses need to be designed! Hansen has the blueprint we all need to follow if we are to put together courses that will produce meaningful and long-lasting learning for our students." Why Create Course Design Documents? Edmund J. Hansen has been the director of the Center for Teaching and Learning at Northeastern Illinois University since its inception in 2001. Before joining NEIU, he worked in faculty development for over twelve years, half of that time at Indiana University in Bloomington, and the other half at Emporia State University in Kansas. In Emporia, he was the founding director of the Teaching Enhancement Center and also an assistant professor in the psychology department. For seven years, Edmund served as President of the Chicago Area Faculty Development Network (CAFDN), a consortium of faculty development offices at both two and four-year institutions in the region. He has published articles and book chapters related to the improvement of college teaching, including the integration of instructional technology into the classroom. He is originally from Germany, where he worked in adult education. Edmund has a PhD in Educational Psychology from Indiana University, and Masters Degrees from the University of Pennsylvania and from the University of Aachen, Germany.